1: May 6, 1969, Record Plant Studios, New York / 2: February 14, 1968, A&R Studios, NYC / 3: May 13, 1969, Record Plant Studios, New York / 4: June 19, 1969, Record Plant Studios, New York. First appearance on vinyl of 4 songs which will finally appear on VU and Another View mid-80s "unreleased recordings" albums. The tracks offered here are however acetate rough/acetate-real versions. Side 1 : 1. The Primitives - The Ostrich / 2. 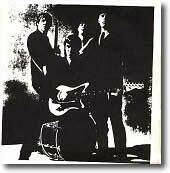 The Beachnuts - Cycle Annie. Side 2 : 3. The Primitives - Sneaky Pete / 4. 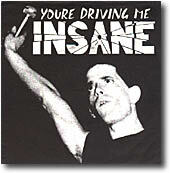 The Rougnecks - You're Driving Me Insane. 1, 3: 45, Pickwick City PC-9001, 1964 / 2, 4: Soundsville! LP, Design DLP-197, 1965. 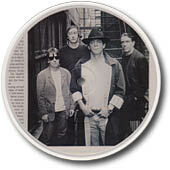 This EP offers 4 Pickwick-era recordings featuring Lou Reed. Back cover says "SPECIAL THANX TO: Pickwick City Records (#9001 A/B) for tracks (i) and (iii), DESIGN rec'ds (SOUNDSVILLE, DLP-187) for (ii) and (iv), Steve Bennett, Jerry Vance ("We recorded the 'Ostrich' as a goof! 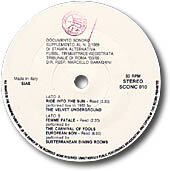 "), Lenny the K, and CIA rep Constantine Radoulavitch..."
Both tracks from Soundsville! LP (Design DLP-187, 1965) with Lou Reed as co-writer and lead vocals. Front and rear cover photos shot by Lee Childers at the Max's Kansas City in 1970, originally published with Lester Bangs' Dead Lie the Velvets Underground - R.I.P. - Long Live Lou Reed (Creem, vol. 3, no. 2, May 1971). "Skydog distribution" edition: dull black & blue cover. "distribution SKYDOG 45-47 rue d'Hauteville - 75010 Paris - Tél. 246.41.49" printed on back cover. Blue label. "Open Market distribution" edition: glossy black & blue cover, "FRENCH DISTRIBUTION: OPEN MARKET 58 RUE DE LOMBARDS PARIS 75001" on back cover. Blue label - just a bit darker as compared with the Skydog edition. Same matrix numbers as Skydog edition. "Black and white" edition: black & white opening picture sleeve with inner sleeve, no distribution mentioned on back cover. White label. Matrix numbers are different: 83022 1 BE / 83023 1 BE. excerpt from the "Guitar Amp Tape" Sister Ray, Boston Tea Party, Boston MA, March 15, 1969. Free flexi coming with Spanish Feed-Back book by Ignacio Julia. Side 1 : 1. Ride Into The Sun (2:59) / 2. Ride Into The Sun (3:08). Side 2 : 3. Beginning To See The Light (4:47). 1, 2 : September 5, 1969, Record Plant Studios, New York / 3 : extented mono mix, November/December 1968, Sunset and Highland Sound, Hollywood CA. The two versions of Ride Into The Sun seem to be actually the same take, one with studio chatter intro and the other one without. Beginning To See The Light is a rough unedited studio version - same take as third official album version but it doesn't fade out. SP 1: 1. Waiting For My Man (5:25) / 2. Wild Child (5:30). SP 2: 3. Femme Fatale (3:10) / 3. I'll Be Your Mirror (3:05). 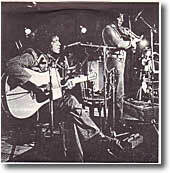 1-4 : John Cale, Lou Reed & Nico, Bataclan, Paris, January 29, 1972. Folded picture sleeve. 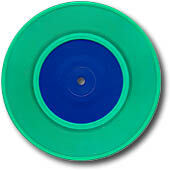 Coloured vinyl, blue or clear wax. 300 copies only. 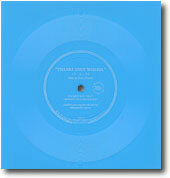 Some clear wax editions have blue and yellow labels, some other have red and yellow labels. 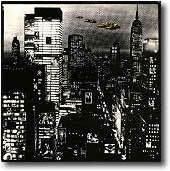 Also exists on regular black vinyl with red and yellow labels or pinkish-red and yellow labels - same matrix numbers. Side 1 : 1. Ride Into The Sun. Side 2 : 2. Femme Fatale / 3. European Son. 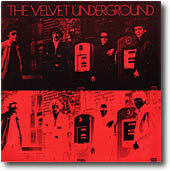 Free with Italian Velvet underground lyrics book (Stampa Alternativa). Track 1 is listed as a 1967 live recording, but a 1969 studio recording. Tracks 2 and 3 are covers (Femme Fatale by The Carnival Of Fools and European Son by Subterranean Dining Rooms). 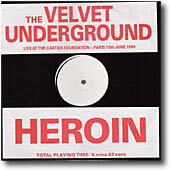 1 : Interview excerpts/Heroin, Fondation Cartier, Jouy-En-Josas, France, June 15, 1990. Flexi free with issue 4 of What Goes On fanzine. Side 1 : 1. Pale Blue Eyes. Side 2 : 2. I Can't Stand It. 1 : End Of Cole Ave, Dallas TX, October 19, 1969 / 2 : The Matrix, San Francisco CA, November 1969. Folded picture sleeve with photo from the White Light/White Heat promo photo session. 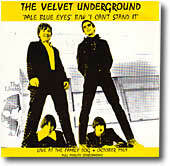 It says "Live at the Family Dog in '69", but the two tracks are coming from official 1969 Live. Backcover also says "not from the forthcoming lp 'VU LIVE AT THE FAMILY DOG'" - a record which was actually never released... Neutral dark blue labels and clear green vinyl. 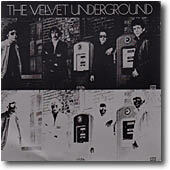 1 : studio version (one channel of the Valentin mix take), 1968 / 2 : Lou Reed, Roskilde Festival, Denmark, June 30, 1984. Limited edition of 500 copies. "Not for sale" printed on the label. Picture fold over sleeve in two color versions - silver or red - with a nice rare 1969 "petrol pumps" photograph by Roswell Angier, both with the same matrix numbers. Also exists as limited "preview edition" of 150 numbered copies, silver cover with sticker, and plain white labels. A-side : 1. Booker T.
B-side : 2. Booker T.
Original studio instrumental section of The Gift (same track on both side). Fold over picture sleeve with a rare outtake of the White Light/White Heat promo photo session, and negative of the same picture on rear. "Not for sale" on label. 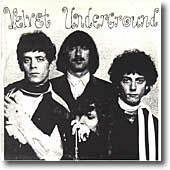 Velvet Records is "A division of White Heat Inc." (sic!). There is two different picture sleeves: black & silver or black & red. 1, 2 : Fondation Cartier, Jouy-En-Josas, 15/6/90. White label. Side 1 is the same as side 2. 7 inch 33 RPM, COM 2, ? Side a: 1. Yarbirds only LA appearance / 2. 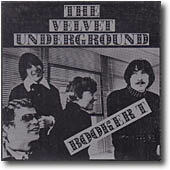 Velvet Underground at The Trip / 3. Action USA New Years Eve / 4. Monkees first Cal. show / 5. Male Ml Shop / 6. Flaming Fire Races. Side b: 1. 21 Sounds For The Sun Set / 2. REVOLUTION! / 3. Back To School / 4. Doors and Staple Singers / 5. The New Cream / 6. Iron Ban. 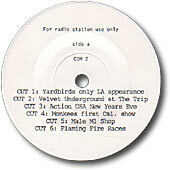 This 7 inch offers a collection of 12 radio cuts including an ad for the Velvet Underground gig at The Trip in Los Angeles CA in May 1966. 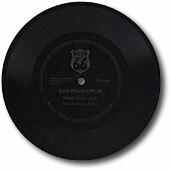 7 inch picture disc, 1998? Supposedly a limited pressing of one copy - probably a home-made record. Nice picture disc, no VU sound however.